Jesus taught the great lesson how if we were evil yet we’d still be able to make the right choice in giving our children good gifts, then our heavenly Father knows what great value the Holy Spirit is to His children that ask for it. (Luke 11:9-13). 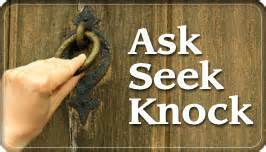 And I say unto you, Ask, and it shall be given you; seek, and ye shall find; knock, and it shall be opened unto you. For every one that asketh receiveth; and he that seeketh findeth; and to him that knocketh it shall be opened. If a son shall ask bread of any of you that is a father, will he give him a stone? or if he ask a fish, will he for a fish give him a serpent? Or if he shall ask an egg, will he offer him a scorpion? If ye then, being evil, know how to give good gifts unto your children: how much more shall your heavenly Father give the Holy Spirit to them that ask him? Sometimes what we hope and pray for is not in our best interest, or maybe without knowing it we receive not …… not because it is out of a worldly need and not a spiritual one therefore we ask amiss. (James 4:1-3). From whence come wars and fightings among you? come they not hence, even of your lusts that war in your members? Ye lust, and have not: ye kill, and desire to have, and cannot obtain: ye fight and war, yet ye have not, because ye ask not. Ye ask, and receive not, because ye ask amiss, that ye may consume it upon your lusts. Our Lord has shown us the importance of submitting to the will of God and not our own will, for an angel appeared and strengthened Him after praying to the Father that it be His will and not His own. (Luke 22:41-43). And he was withdrawn from them about a stone’s cast, and kneeled down, and prayed, Saying, Father, if thou be willing, remove this cup from me: nevertheless not my will, but thine, be done. And there appeared an angel unto him from heaven, strengthening him.